This the perfect post for today - Be Happy! We here in Northern Virginia got our first "good" snowfall of the winter last night - 5 " here at my house - and we all got to sleep in this Monday morning! Yippee! After laying around all day yesterday waiting for the snow, I figured I'd better accomplish something today, so I came down in the studio to alter this fun little notebook that I picked up at Target a few weeks ago. I forgot to take a 'before' picture, but it was decorated with some colorful butterflies on a kraft background. The burlap edge was there and I decided to use it in my design. This first picture is my lame attempt at a close up of the cool flower accent on the cover. I'm really dating myself here as far as how long I've been a Stampin' Up! 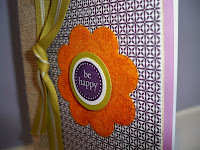 nut - the orange fuzzy flower is made with "October Orange Stampin' Flock" that I just HAD to HAVE from an SU! catalog about 10 years ago! In fact, I think that color retired in 2000, so it's long gone - but me - hoarder of all hoarders still has a nearly FULL container! I think SU! should bring those flocks back again so I can use them in classes, yeah, that's it! Anyway, to create the flower, I used the large flower from the Sticky Cuts Letters (just like Sticky Strip, but a package of letters and shapes - waaay cool!). This was adhered to the front of the altered journal - more about that in a minute - by peeling off the white backing paper and sticking it down. Then I removed the red plastic side covering the 2 sided adhesive and poured on my fuzzy orange flocking. I used my finger to rub it in real well, so it feels like one of those cards you buy in the @$%^#&*& store that has the fuzzy duckies on it. Yeah, I know you do because we don't sell flocking anymore - SU! are you listening? LOL! The center of the flower was made by punching a 1 1/4" circle with my punch out of Kiwi Kiss cardstock. 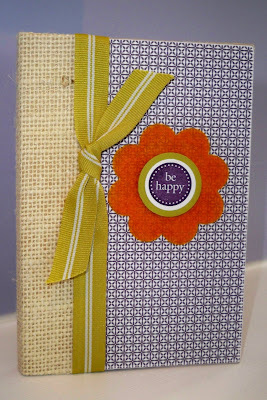 I stamped "Be Happy" from the Delicate Dots stamp set (hostess only!) in Elegant Eggplant on Whisper White cardstock and punched it out with my 1" Circle punch. This was layered with Stampin' Dimensionals and attached to the front. Creating the covered book was the easiest part. I took Designer Series Paper from the Perfect Plum Patterns pack and cut two pieces, one for each cover. These were adhered with my Tombow Multipurpose Adhesive and then I smoothed out the edges with my Sanding Block. To cover the seams on each cover, I wrapped them with Kiwi Kiss Striped Grosgrain Ribbon and knotted the one on the front. The little ribbon tails remind me of leaves. Hey, that reminds me - if you are on my mailing list, you should have received the info last Friday on my Ribbon Share Groups that are filling now. The first group is filled and I'm working on the second one. If you want to be part of this great deal on ribbon, be sure to contact me - the first groups are being ordered on Friday, 3/6. This offer will be opened up to my blog readers in a few days. Be Happy today everyone! Hug the ones you love! Such a cute note book! I'm totally jealous that you have 10-year-old orange flock. I'm with you, Fuzzy is hip again and we need it back!